The Purpose of IWSG is to share and encourage. Writers can express doubts and concerns without fear of appearing foolish or weak. Those who have been through the fire can offer assistance and guidance. 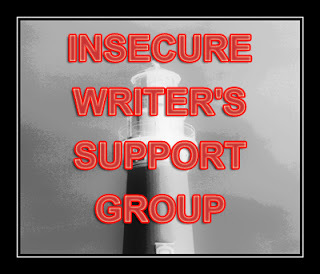 It’s a safe haven for insecure writers of all kinds! To join IWSG visit Ninja Captain Alex J. Cavanaugh here. A short post today with an important message. Did you know there’s a powerful link between perfectionism and procrastination? It makes me sad so many of us beat ourselves up with the idea that procrastination is indolence when so often we postpone tasks not because we’re lazy, but because we’re terrified of getting it wrong. Don’t try to inspire with perfection. Inspire with how you handle your imperfection. It’s a brand new year, in Oprah-speak, another chance to get it right. Get out of your own way in 2015! I hope that in this year to come, you make mistakes. Because if you are making mistakes, then you are making new things, trying new things, learning, living, pushing yourself, changing yourself, changing your world. You’re doing things you’ve never done before, and more importantly, you’re Doing Something. So that’s my wish for you, and all of us, and my wish for myself. Make New Mistakes. Make glorious, amazing mistakes. Make your mistakes, next year and forever. “Be kind to yourself in the year ahead. Meet new people and talk to them. Make new things and show them to people who might enjoy them. If we sit down and write the best we can, we will be surprised at the best we will produce, right? Yes! Thank you for this, Roland. It never ceases to amaze me how Neil Gaiman manages to (forgive me) cut the crap and remind us of what’s truly important without feeding us platitudes. Happy New Year! Although guilty of the occasional self-sabotage, I hadn’t considered the link between procrastination and perfectionism either, Pat. Great post, VR. My procrastination comes in a few games like Spider Solitaire, Sudoku, and Tetris. Somehow when I play a game or two, my mind clears, and I’m back at work. I’m too old to worry about being perfect. I’m not and never have been, though I’ve been good at a few things. Once you come to that conclusion–not that you’re incompetent or even mediocre but good and not perfect, life is a lot simpler. I agree, Polly, although I do have have a few issues with implementation. While I’m well aware I’m not perfect, there are days I think if I just keep rewriting this or that paragraph, just maybe it could approach perfection. In the old days I used to rewrite, rewrite, and rewrite some more. Now I leave my desk and do something else until common sense returns. Neil Gaiman is one of my favorite authors. He’ll tell you himself that he made loads of mistakes, and encourages you to keep on making them just like he does. That’s inspiration. Neil Gaiman is one of my favorites as well, Tanya. Yes, his words are inspirational, but he also sets a great example. He’s not afraid to try new things and explore new territory. Thanks so much for stopping by! Wonderful advice and thoughts from the both of ya. Procrastination and avoiding risks are two things I tend to struggle with. Thanks for the encouragement, and may you have a wonderful day. I struggle as well, M.R.R. Maybe we all do to some degree. Thanks so much for dropping by! Absolutely, Chrys. Bird by Bird is amazing. In fact I really should give it another read. A little inspiration to begin the new year! Wonderful quote by Gaiman! LOVE IT! God only knows I make mistakes all the time. LOL. So I guess I have that covered. But I am that horrible perfectionist too… But I’m learning to push that out of the way. NO MORE… Just go for it. And I plan to this year. Traveling about…. looking, searching for my next home. The NY coop deal fell through… bummer. The owner took a bigger offer even though we had a contract. SO now I am off looking again. Back to dreaming of warm days in the south…. I am off to ATLANTA… you’re old stomping grounds. I had lived there in the mid 90’s and LOVED it. So I need to check it out again… After four fun days, I will head further south to south Tampa… SOOO lovely. Will my dream home be there? Hmmm. Then OFF to NYC for the SCBWI conference. Of course I will want NY again once I go home. SO Lots of traveling/driving… and more mistakes. LOL…. Who knows where I’ll end up? Or how many mistakes I’ll make along the way? BUT… in the meantime, I have my rental until Nov.2015…. Chicago is FREEZING, so I am counting the days until the 16th and I head south…. As for Ms. Lamott… she is SO CORRECT. I know perfectionism has stopped me in my tracks way too many times! ALL the best to you for this and coming years… You will get the social media thing DOWN… You have an amazing way about you Vi…. Like you, I’m good on the mistakes. LOL. The longer I write, the more I realize perfectionism is a moving target. My idea of perfect isn’t necessarily anyone else’s. And what’s considered perfect in the publishing world changes from day to day, so why waste time with it? I think it’s chilly in Atlanta right now, but not compared to Chicago (or here, for that matter). Tampa will be amazing, and I can’t wait to hear about your SCBWI experience. You will shine! Great advice! We are our own worst enemies, aren’t we? Funny, last night’s Person of Interest explored a similar theme. Kind of. At least, that’s what hit my mind while I was reading this–how the Machine was so worried about making a mistake it couldn’t make the first chess move. Yep, that’s it, Liz. And if we’re too worried to make a move, we aren’t even in the game. It’s hard to admit that you’ve purposely grounded yourself to avoid failure, because that is in essence a failure to even try. The irony of the situation is so powerful, yet we are often completely blind to it. True, Steven. Accepting responsibility for one’s own inertia is not for the faint of heart. It’s so obvious when you say it… I am by NO means a perfectionist, and I am relatively productive. I am married to someone who thinks of every single thing that could ever go wrong and therefore doesn’t actually even set any goals. It’s debilitating, being a perfectionist. Procrastination as a way of avoiding perfection? Thank you VR. This is a cool post. Loved the inspiration. I put the “..In 2015 . .” paragraph on my left sidebar as writing inspiration for 2015 for me. Linked it to this post. Let me know if you want it removed. I hope 2015 treats you well VR. Thank you, Donna. I’m honored! Wishing you a brilliant 2015 (and beyond). Add A TWIST OF HATE to your Goodreads shelf! Available at Amazon and B&N: FREE! © VR Barkowski, Writer in Progress, 2009-2019. Unauthorized use and/or duplication of this material without express written permission is prohibited. Excerpts and links may be used, provided that full and clear credit is given with appropriate and specific direction to the original content.